My two shadows, a pair of shelties, were the taste-testers once again for this dog biscuit recipe. And, yes, once again, I tried it with them! In fact, we tried several versions until we had tweaked the ingredients to provide the best taste combination in a jar mix recipe. These cookies are more flavorful than you might suppose; the boullion granules lend a beef or chicken base, but are not overpowering, while the parmesan and garlic are well represented too. Very intriguing for my dogs — who were sniffing the air all around the oven once they realized that the baking was for them! 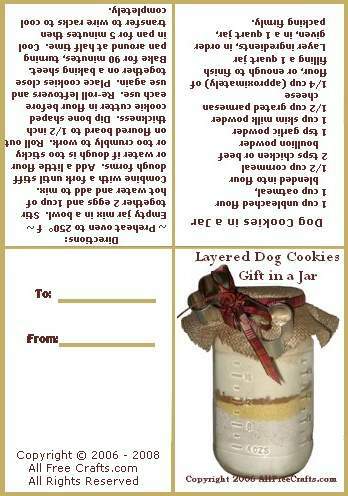 The recipe for the dog cookies, plus the directions to bake them, are all included on the free printable jar label. Just print, cut out, and fold as you would a four fold card – in half, then in half again, so that the photo is on the front and the recipe and instructions are inside. On the back, you’ll have a “To” and “From” tag for gift giving. Preheat oven to 250° farenheit. Empty jar mix into a bowl. Stir together two eggs and 1 cup of hot water and add to mix. Combine with a fork until a stiff dough forms. Add a little flour or water if dough is too sticky or too dry to work. Roll out dough on floured board to ½ inch thickness. Dip cookie cutters in flour before cutting out each cookie. A bone shaped cutter is preferred, but any shape will do. Re-roll the leftovers and cut as many cookies as possible. You can place cookies close together on a baking sheet as they will not spread while baking. Bake for about 90 minutes, or until cookies are dry and hard, turning pan around at half time to ensure even cooking. You can turn off the heat, but leave the cookies in the oven to dry out without further cooking if necessary. Dog cookies are usually baked until they are hard and crunchy. Let cool completely before storing in an airtight jar. Use a funnel to layer ingredients, in the order given, in a one quart jar, packing each layer firmly with the back of a spoon. 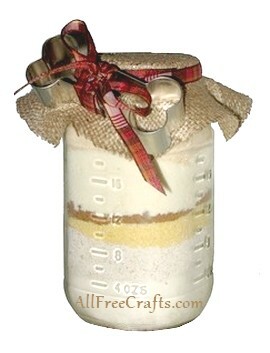 To make the jar decoration shown, fasten a 6″ circle of burlap or canvas to the jar lid with a rubber band. Tie a long tartan ribbon around the rubber band leaving both ends loose. Print the label and fold into a small card. Punch a hole in the top left corner. Thread the ribbon through the hole and knot to secure. Add the cookie cutter by circling it around the middle with first one end of the ribbon, then the other, with each end going in opposite directions so you can tie them together. Finally, form a small bow then trim the ends evenly, using a slanted cut to help prevent fraying.